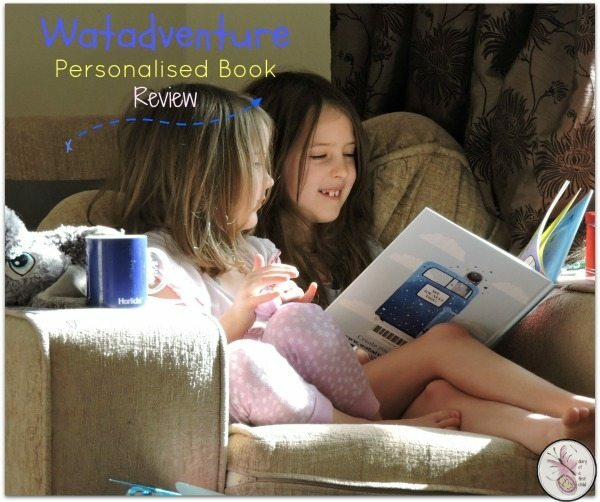 When I agreed to review the Watabus personalised book, I really had no idea how popular it would be. I decided to wrap it up and give it to my daughter for her 5th birthday, and her 7 year old sister loved it so much, she wants one for her next birthday too! I think that speaks for itself as to the quality of the book. Personalising the book on the Watabus website is super simple. 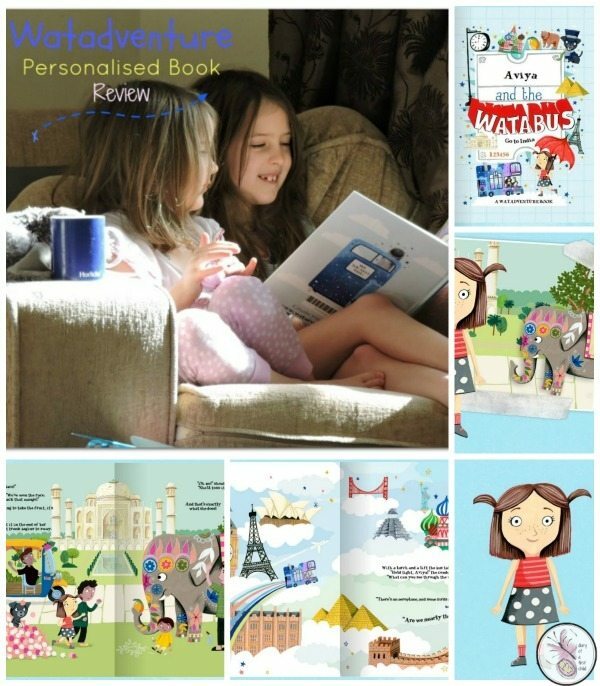 [pullquote]”I love that mama made a story about me!” Aviya, Age 5[/pullquote]First, add the child’s name, then change the appearance of the character – choose skin colour, freckles or not, hair style and a choice of four colours, eyewear, and clothes. 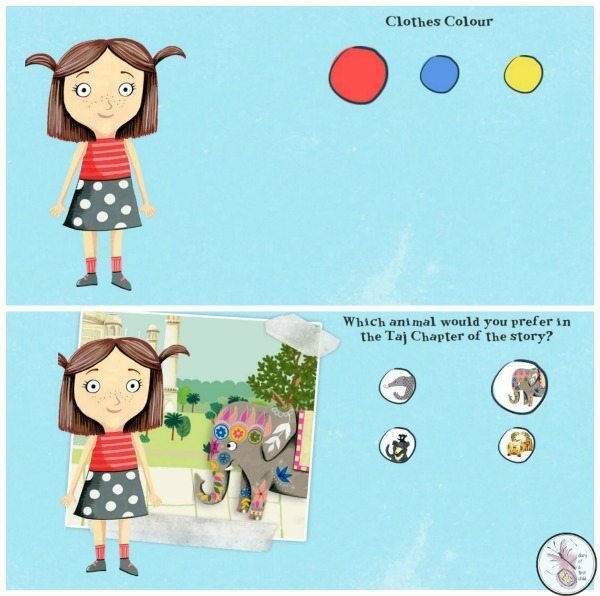 Next you can add other characters to the story – the animals that will appear on their adventures. 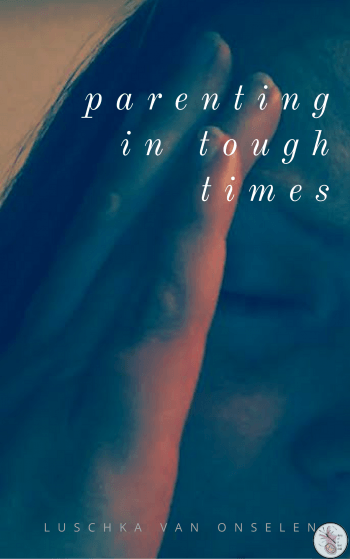 Finally you can preview the book online, before going through to the ordering page. There’s really very little effort to it. The book arrives in careful packaging, well protected. The Watabus adventure itself is a hard back book with a beautiful glossy cover, and thick, glossy pages. The quality of it is really quite something special. 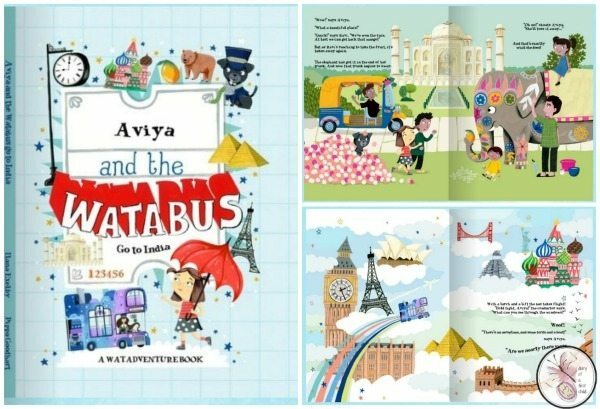 The story – that of Aviya bored on a rainy day, entering her den and coming out in the rainy street boarding a magical bus that takes flight past landmarks such as Big Ben, the Pyramids, the Sydney Opera House, the Great Wall of China before landing in India. There she meets a fruit seller who tosses her a mango, but oh no! It’s intercepted by a monkey who runs off with it, leading our adventurer into a forest, down the ocean, past the Taj Mahal and back towards the bus. It’s a colourful, bright, bold adventure with plenty to look at and point to and talk about on every page. I love the small details too, like the conductor’s map – coat, the elephant’s decorations and the mama washing dishes – that’s where I seem to be for most of the adventures going on around me! The only slight criticism of the book is that the Indian characters look very Caucasian, and if you didn’t read the name, you’d not know Ravi to be an Indian fruit seller. We love the Watabus adventure though, and I’m really hopeful that they’ll have another – maybe to Italy, or Australia – for us by the time we need another for October’s birthday! We were sent this book free to review. Opinions are our own.